Full Qmac QM9913 Manpack System. HF90 Transceiver with TM90 manual manpack Tuner. 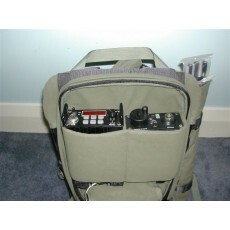 Comes complete with Mains charger/12VDC charger/Olive drab Backpack/whip/charger and acc. Excellent condition-Never used out in the field - Only been used as our test system. S/N 50xx-Can be set up in "Advanced Mode" to be field programmable-ACMA Licence conditions apply.